Your Attention Please: The Quatchi Kid! Looks like Squatchi has a new Quatchi-inspired rival in town, and his name is the Quatchi Kid. We first showed him down at the bottom of our Quatchi’s Halloween in January post. As it turns out, he’s got his own Facebook page, featuring the funny Adventures of Quatchi the Kid photo album. 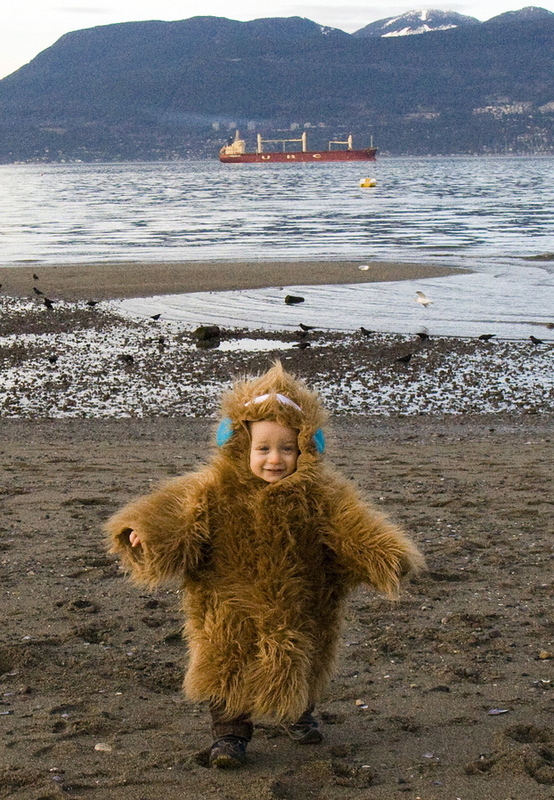 His raison d’être is to meet “his long lost brother, Big Quatchi.” In the meantime, he seems happy cruising around Vancouver, having his photo snapped by his new fans. The Kid’s real name is Julian, and the costume was originally made for Halloween by his mom, Janette. Be sure to check out these additional Quatchi Kid pics on flickr. This entry was posted in Uncategorized and tagged crafts, Halloween, Quatchi, Squatchi. Bookmark the permalink. omg so freakin cute!!! His fb page is a really good read.